So we had a rough Memorial Day weekend here in the Atkins home. First Owen was diagnosed with a double ear infection on Thursday…which wouldn’t be so bad but he HATES to take medicine so almost every time we give it to him he proceeds to throw it back up. 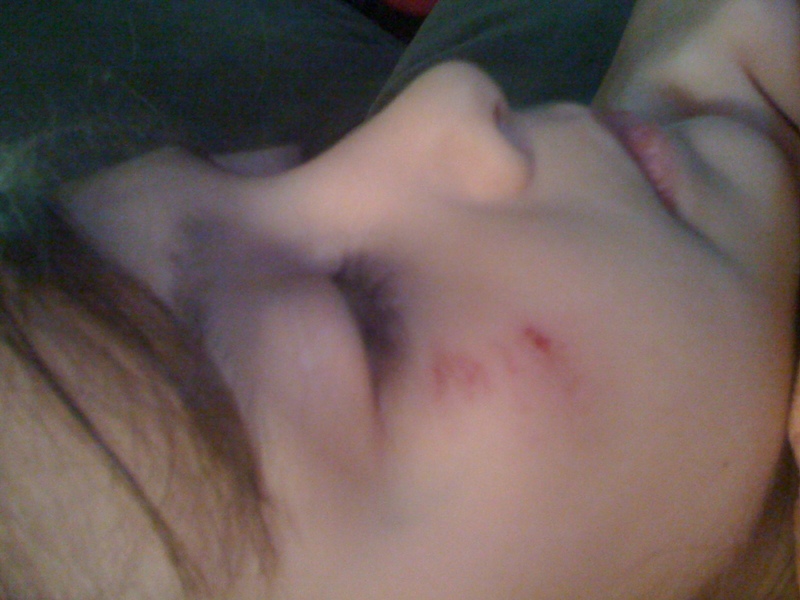 Then on Saturday Addyson decided to jump into the back of the couch (with all the pillows removed for any kind of cushion) and bruised/face burned her cheek pretty good (see picture below). Oh yes, and then Sunday morning she started running fever so we fought 103+ fever for most of the day when around 4 pm she started throwing up, which was interesting because she hadn’t eaten anything since lunch on Saturday. This continued most of the night until around 2:30 when her fever finally broke and she slept well for the rest of the night. But Monday morning she was complaining of a very sore throat so we headed to the doctor where we learned that an intestinal virus was going around, yeah us! Monday was spent at home drinking lots of fluids and praying that no one else in our family got it! So today is Tuesday and we’re much better, please join me in praying that it stays that way for the rest of the summer! This was taken 2 full days after the occurance.